It’s January in Philly. An extra-cold January, to boot. What’s a gardener to do? Ideally, she would get to work all those non-gardening tasks that are neatly listed before her. But nooooo, avocado pits prove themselves to be far more fascinating than writing a presentation on green technical communication. Don’t ask. Apparently, it’s fairly easy to grow your own avocado tree. 1) Roast a chicken. Use the leftover chicken to make a cobb salad. Save the avocado pits. 2) Rinse the pits under cool water. 4) This will allow you to suspend the pit in a glass of water. The flat side of the pit should be in the water and the pointy side should be facing straight up. 6) You’ll need to train the tree to encourage root growth and shrub-like growth, rather than tree-like growth. So, when your sprout is five or six inches tall, pinch off the top set of leaves. A new set of leaves should sprout in a couple of weeks. 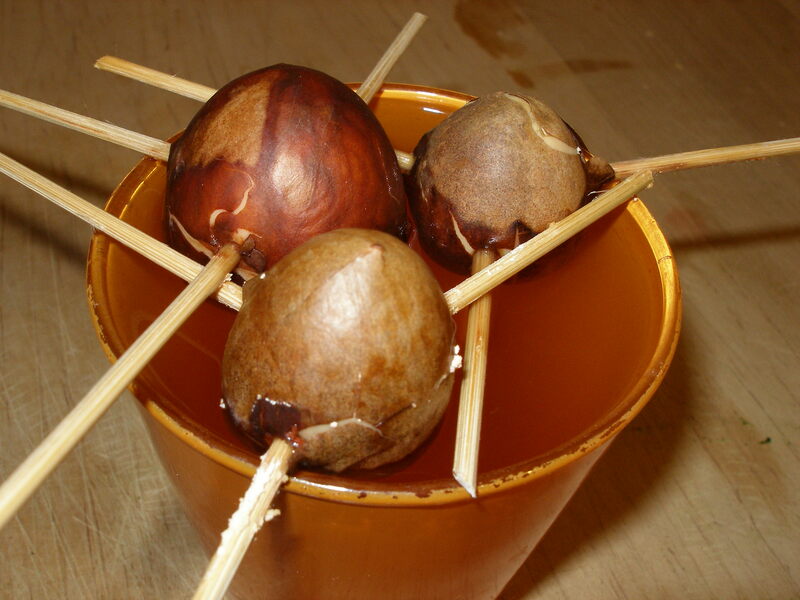 7) After the new set of leaves have grown, you should have a decent set of roots on your avocado. Plant your pitlings in a large pot 10-12″. Place the pitlings in the soil — you’ll want to have the upper half of the pit above the soil line. Add a little more soil if necessary, pressing down to remove major air pockets. 8 Water slowly, gently and generously. Keep the soil moist. 9) Evidently, these suckers can grow up to 20-40′, so it’s important to pinch leaves off regularly to encourage a bushy plant. So, every six inches or so, lop off the newest sets of leaves. It’s a good idea to plant more than one pitling to encourage pollination. 10) Will you ever harvest an avocado? Maybe…after three or four years or so. In the meantime, though, it makes for excellent procrastination material and will, one hopes, replace the anemic bamboo growing in the office sill. It’s better to gently peel off that thin brown shell while cleaning the pit. (easier if you let it dry off a bit after washing, and before sticking the supporters. I have 8 pits in my windowsill and I get some of yeast (orange-red in my case!) only on the ones I left unpeeled. But not all of them. They really do crack and it’s like magic. They like warmth though. I use the radiant heat from the floor. That makes perfect sense! Thanks. I just started growing my own avocado. I recognize the there is some white stuff on various parts of the pit. It looks just like the one you have in your photograph. Its it normal? True confessions: I think my avocado is dead. I planted the thing soon after the “Just like Christopher Walken” post but nothing’s happened since. I’m not giving up, though. I’m determined to make this experiment work. I think that I killed this particular seed when trying to remove the bamboo sticks as it split cleanly into two halves. Which would be normal, if the green shoot had been ready to emerge. Which it wasn’t. Next time I’ll be a little more gentle about sticking the sticks in and taking sticks out. I didn’t get too worried about the white stuff. It didn’t appear to be a mold or fungus so I was able to pretend it wasn’t there. Sorry I can’t be of more use to you. Good luck, though. Please let me know if you were successful! Thanks for the info! Don’t worry, no downing here — I wasn’t banking on POD-grown guacamole anyway. Honestly? It’s just something to keep me occupied through the cooooooold winter months. I’m just jealous of your Cali clime right now. Be prepared for the avocados you’re growing to bear fruit that does not resemble what you ate in the cobb salad. And also, most avocados are grafted onto healthier, more disease-resistent root stock. I don’t want to be a downer, but it is really hard to grow good fruit trees from seed.